HockeyPucks hiking and highpointing: Mt. Greylock - 3491 Ft.
From route 8 in Adams turn onto Friend street / Notch Rd, follow it 1.0 miles to the 4 way stop. Continue straight onto West Road for 0.55 miles and turn right onto West Mountain Road for 1.5 miles to the gravel parking lot at the end. Parking is available for 10-15 cars. The Cheshire Harbor Trail is one of the more popular routes to Mt. Greylock. It begins at the end of West Mountain road at the northeast corner of the parking lot and bears left through a grassy field. Enter the woods and reach the rocky carriage road as it passes around a gate stating no wheeled vehicles are allowed. The trail is a gravel road that begins with easy footing over an easy grade. After 5 minutes you reach the first in a series of switchbacks and the intersection with a blue blazed trail continuing straight. Follow the carriage road 1 mile to the intersection with the Old Adams Road trail. From here the trail narrows but is still wide enough for a 4x4 vehicle and terrain becomes loose rocks. At approximately 1.5 miles the Pecks Brook Loop trail enters from the right and terrain becomes even more narrow with even looser footing. The trail is wet in places and I noted this stretch of trail as "ankle-sprain terrain" due to the loose rocks under foot. After 0.9 miles you cross a small footbridge, increase a moderate grade and reach the intersection with the AT and summit road. Follow the AT across the road as it follows foot bridges then along the perimeter of a small lake before merging with the summit road a second time. 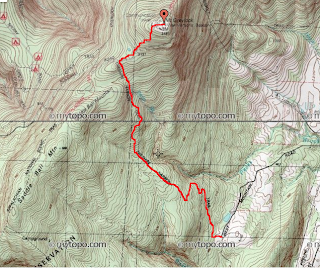 The AT continues a 0.15 miles to the summit. 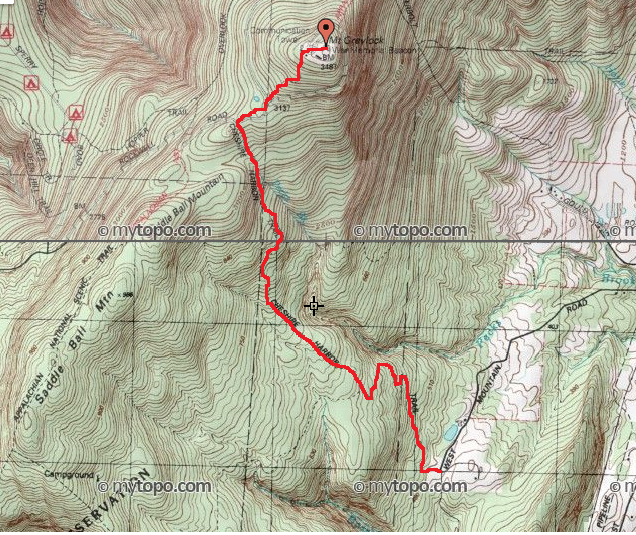 You exit the trail in a parking area and the summit is a short distance across the parking lot. The summit is mostly open and marked with a large War Memorial Tower and has 50-60 mile views to the east. Mt. Greylock is the highest point in the state of Massachusetts at 3491 feet. It's summit contains a Massachusetts War Memorial and offers spectacular views of the surrounding area. There are 2 roads leading to the summit making it a popular place for tourists. It also contains Bascom Lodge which is a large rustic stone lodge built in the 1930's to provide accommodations to hikers, vacationers and nature enthusiasts.